A kite surfer said he was attacked by a shark while riding the waves off a Florida beach last weekend. Kurt Hoffman said his parachute-sized kite was pulling him along the shore of Delray Beach when he felt the big fish suddenly chomp his forearm on Saturday. “I go to cut back on wave. Then, all of the sudden, it went after my forearm, " Hoffman told the Daily News on Monday. "(The shark) took a grasp at it, clenched on it like a bear trap." He said he fell into the shark — apparently spooking the creature before it swam away. Kurt Hoffman said a shark attacked him while he was kite surfing along Delray Beach in Florida. Kurt Hoffman said he was kite surfing along Delray Beach when a shark suddenly bit him in the arm on Saturday. "I used the kite to pull me in really fast, " Hoffman said. "And kept my feet up, just in case it would take a bite out of my leg or foot." He said he was grateful the shark didn't hang on long enough to cause any further damage. "I'm still alive, " he told The News. "That's good." 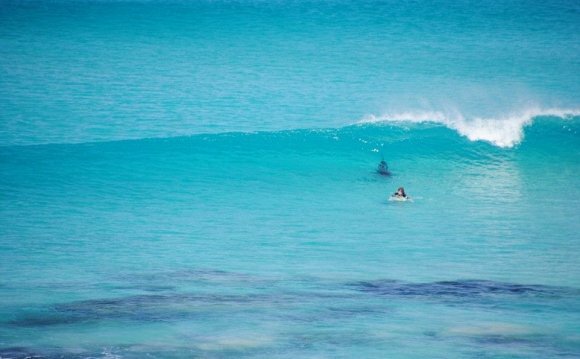 Even though he's seen sharks in the water before over the past 20 years, he said he'll keep a closer eye out for them next time he hits the waves.